Wedding planning is a big project not to mention the added pressure because the wedding planning in question is your own! What is the best venue for weddings? Which leads to so many other questions and tasks to tackle to plan the big day. 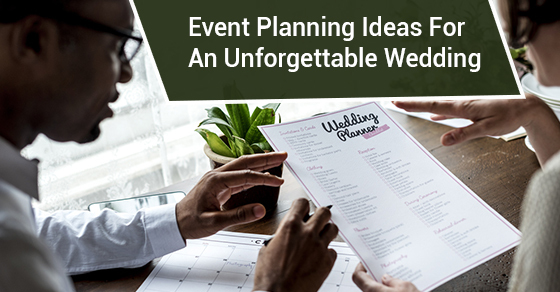 There’s a long list of tasks that are part of your wedding planning, and the venue is just one of many crucial aspects to manage when planning a beautiful and memorable wedding reception. Begin by creating a master document for your wedding planning. Include all tasks and timelines, as well the important question you still need to be answered, what is the best venue for weddings? This will be your wedding planning timeline and will guide you through all key tasks including vendors you can book a year before your wedding date right up to the day of. Moving along to the best part of wedding planning for any bride: The dress! Along with hairstyle and makeup, the dress is the true centerpiece of a wedding. All the different styles of dresses and variations can feel overwhelming for some women while others have had the vision of their dress since they were a little girl. Let your choice be guided by your taste, the theme of the party, and venue in wedding planning. The best venue for your wedding will depend on the season to which the wedding will take place. Summer weddings can feature outdoor venues, fresh flowers, and stylish cool drinks. Winter weddings can incorporate a wonderland theme, while weddings held during the spring or fall offer a range colour possibilities and foliage choices. For some, a change in surname may be in order following the wedding. It’s quite a process because your wedding planning needs to include the legal, medical, and work aspects of a name change, not to mention personal lists or social media accounts. Wedding planning guides often leave the photographer to wander and take photos as she or he sees fit. Instead, communicate with your photographer and provide them with a copy of the full itinerary. This way, they’ll be sure to capture all the memorable moments for you to cherish for years to come. A wedding planning budget is so vital and as such, clarifying how the cost is divided among the family may be a good idea for most couples. This will prevent unexpected costs, debt, and hard feelings after the wedding is through. Your wedding planning may include a cake. Perhaps the wedding venue and decor ideas will influence your choice of cake. Will it be a classic three or four-tier, a modern creation with striking flourishes, or a vintage art deco creation? During the days leading up to the big day, produce a micro wedding planning guide for who does what on the big day. Letting people know their duties and timings will make things go smoothly. If you’re looking for a luxurious event venue for your upcoming wedding or special event, contact Chateau Le Jardin at (905) 851-2200. We’ll connect you with one of our professional event planners who can help you make your dream wedding a reality.